Marianne Wakerlin's wildly styled socks are hand-knit from skeins of recycled cotton yarn. Inspired by the colors of the autumn horizon, Marianne Wakerlin's wildly styled socks are hand-knit from skeins of recycled cotton yarn. In a funky palette with coordinated yet mismatched designs, these cozy accessories repurpose perfectly good cotton strands, which reduces the amount of water, land, pesticides, and herbicides used to grow new cotton fibers and eliminates the need for harmful chemicals to dye virgin cotton yarn. The design, knitting, and finishing final touches for these socks are completed at small, family-owned businesses in Vermont, North Carolina, and Oregon. Surrounded by the brooks and fields of rural Vermont, there lives a Socklady. Marianne Wakerlin, the self-proclaimed “Socklady”, is a designer of colorful, upcycled footwear. At age nine, her mother taught her the delicate practice of knitting, and years later she’d make it into a profession. Marianne’s yarn is made from recovered scraps from the production of other cotton products, mainly t-shirts. Along with her team at the knitting mill, she grinds up the scraps so they can be respun into new, vibrant threads. For inspiration, Marianne turns to the great outdoors or her budding artist daughter, whose mixing of colors and patterns serves as a constant source of inspiration. Machine wash gentle, dry on cool. No bleach. Held up very well after washing, no shrinkage or loss of color. Well made. Perfect instead of slippers. Thicker than standard weight socks but not overly so, may be snug if wearing with shoes. I asked my niece about the gifts from you folks and she responded right away with how much she loved the socks and can't wait to use the Henna Tattooing. These socks are warm, cozy and comfortable. They had their shape and have the perfect weight. Stylish and fun! It matches my moodiness, which shifts from day to day. I have three sisters and these are the best gifts that I can't make myself. 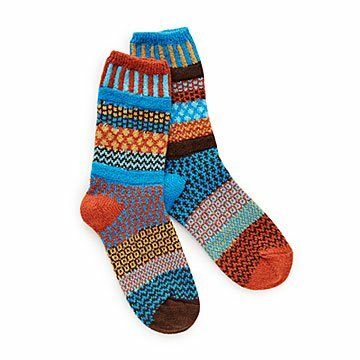 They have patterns and colors that surprise and excite every time you look down at your feet or between your feet as you've propped them up on a coffee table to watch TV.